Conquer corrosion in 3 steps, permanently. Marine corrosion, electrolysis and paint bubbles prevented. Support included. Battery, AC and shore power! We correct the cause. Completely and permanently. No thru hull penetration. No moving parts. No additional coating. No additional anodes. 8 year guarantee. 20 year design life. Stray current causes corrosion. That includes boat or marina, rust, rig and process line corrosion. Termed electrolysis. The SeaBis System controls them all. Corrosion is dependent on an electro-chemical reaction. Identify and correct the stray current and you will prevent ALL corrosion from occurring. SeaBis correctly identifies the CAUSE of stray current corrosion – electrolysis and corrects that cause, saving you thousands of dollars in maintenance and repair. 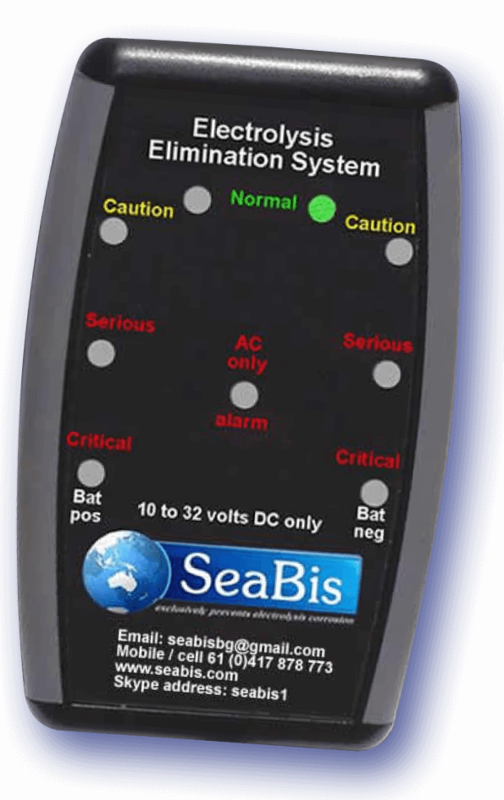 SeaBis Master System stops the CAUSE of stray current – electrolysis. Rust, electrolysis, electrolytic action, marina corrosion, boat corrosion and galvanic are all common names. Rust is simply air carried current often vastly accelerated by stray current – electrolysis. Galvanic is vastly accelerated by electrolysis. The minority cause is two different metals being in proximity in a conductor such as water. Galvanic is a million times slower than stray current corrosion – electrolysis. Anodes, when stray current corrosion is eliminated, will stop galvanic and should last 3 to 4 years. If they do not then stray current is the cause. Stray current corrosion is caused by wiring or equipment defects on board your vessel. I witness stray current destroy commercial propellers and a hull in 10 days, many times every year. It is current flowing from your vessel to the Earth. This is where SeaBis pays for itself, very quickly. SeaBis Master System eliminates stray current CAUSE. So saving you many thousands dollars. Stray current thru electrolytic action creates marine electrolysis corrosion. So the original marine corrosion cause is your vessel creating stray current. If you need additional clarification contact us. How to prevent marine corrosion and electrolysis in 3 steps, permanently. Stray current causes corrosion to be aggressive and very visible. 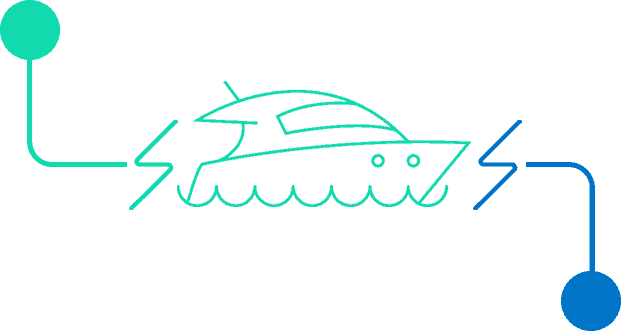 In other words it causes marine electrolysis by electrolytic action. In addition it accelerates rust. Do you doubt corrosion is caused by stray current? Then see Wikipedia, electrolysis. The Wikipedia apparatus power is red and black – so must be Direct Current (DC or battery current). The Wikipedia text clearly states DC current. 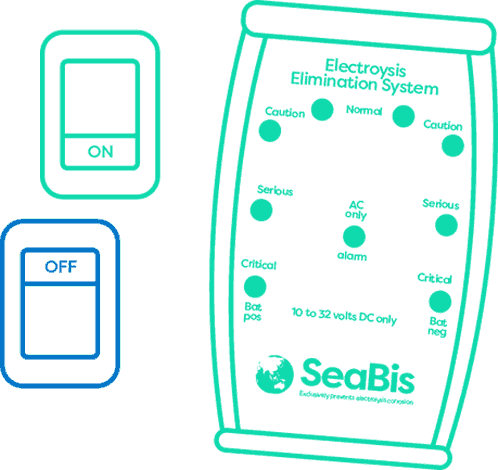 It does not state Alternating Current (AC or inverter or mains or shore power). So shore power or AC cannot be the cause. A one kilo gram or two pound anode generates one millionth of an amp protective current. Stray current is thousands or whole amps. It is at least a thousand times stronger. Therefore you would need at least 1,000 kilo grams of anode! Use SeaBis to prevent the CAUSE, completely and permanently. First the corrosive ability of marine electrolysis depends on causes in your boat. Second every other boat within at least 180 meters. In addition shallow water causes the Earth to have a increased affect. SeaBis measures the total of ALL corrosive current. SeaBis System prevents the CAUSE of marine corrosion, permanently. So prevents nearly all corrosion. The moisture creates an electrical circuit to the Earth. Connecting a battery vastly accelerates corrosive current. So creating marine corrosion by marine electrolysis. Often this is termed boat or marina corrosion or rust. AC is the abbreviation for Alternating Current. It reverses direction every half Cycle or Hertz. A particle removed in the first half Cycle will be replaced in second half Cycle . Therefore AC cannot cause electrolysis corrosion. In addition, if there were DC in AC then every AC appliance would burn out in a few seconds. The reason: DC has no Counter Motive Force (Back EMF). So do not blame the shore connection. Air carries corrosive current causing marine electrolysis. So creates rust. Preventing stray current reduces rust. Wikipedia explains the source: See Wikipedia, Earth based current – the Earth provides a current and electrical path so causing the corrosive current to increase. Water and air are conductors. So complete the circuit to the Earth. 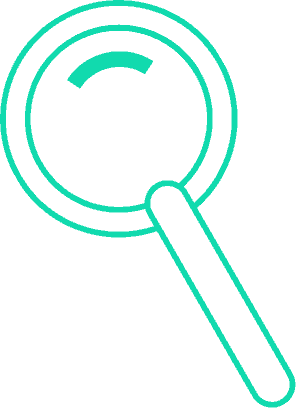 To correct the CAUSE: Use the SeaBis System to identify and PREVENT the cause. 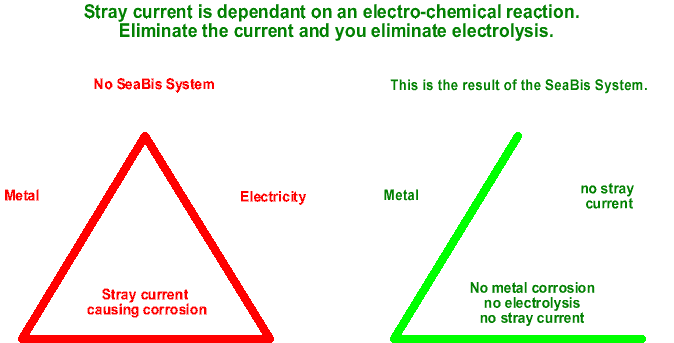 Most importantly stray current is dependent on 3 inputs: moisture, metal and an electrical (stray) current. So elimination of stray current prevents corrosion. In conclusion the SeaBis System with How To Stop Corrosion permanently prevents the CAUSE of stray current that creates marine corrosion by electrolysis. Current explanation at How page. First use SeaBis to measure current flow to the Earth. Observing the lights on SeaBis. Second, identify the circuit causing stray current by switching off circuits until SeaBis Master indicates Normal (green). The last circuit you switched off was the cause. Finally stop the CAUSE, follow How To Stop Corrosion. Then our 8 year guarantee applies. Subscribe to the SeaBis eNewsletter and keep up to date with SeaBis Technology. The SeaBis box proved very useful in tracking down multiple stray current problems aboard our boat. The leading cause was old household wire originally installed by Beneteau and new electronics that had not been earthed correctly. The service from SeaBis was excellent with prompt replies to my queries. I did really appreciate your help. Thanks again for your help, its been A1 service. My wife and I are currently circumnavigating aboard our 45 ft. steel yacht. I purchased a SeaBis System after borrowing a friend’s SeaBis and discovering that I, too, had stray current – a flashing red critical light is hard to ignore. This was after the boat had been tested and cleared by the test bulb method. I have no electrical skills but, by following the system, I was able to detect and eliminate the four causes of stray current – a non-isolated genset, a VHF aerial not insulated from the mast, a fuel tank gauge not insulated from the SS day tank, and the connection between a non 12v computer and the SSB radio – to achieve a very satisfying green normal light. Furthermore, the SeaBis has identified AC leakage from worn brushes in 12v fans and, most recently, a path between the brushes and case on my Balmar alternator, which blew the SeaBis fuse before causing any damage. I consider the SeaBis to be a vital element in diagnosing my yacht’s electrical health. I would also add that Glen has been a great guy to deal with, standing behind his product and providing a wealth of diagnostic advice. You may use my testimonial with verification. Six years ago I purchased a Dutch barge in Amsterdam, shipped it to the UK and spent four years restoring it to a fully functioning residential boat in my spare time. During this process I learnt much about the ways of vessels which has added to my automobile knowledge. One of the things I learnt was that corrosion was destroying my hull which lead into an investigation, this in turn lead me to the SeaBis. I completed How To Stop Corrosion and time has proven the cause is removed. No more stray current corrosion. Well Glen your SeaBis system fixed the cause. No problems in 5 months. It was a deck generator and CB radio. We purchased a steel cruiser 8 years ago and had problems not long after purchase with corrosion on the decks. When the boat was slipped we had evidence of metal corrosion which I think is caused by electrolysis, on the hull as well. When the boat was returned to the water I had a marine electrician check out the boat and he said that our boat was OK and the corrosion was caused by the boat next to us in the marina. We then believed that was the cause, we tried to get the marina to do something about it but they did not want to know. When the boat was slipped 18 months later the corrosion was that bad we had to sand blast back to bare metal and repaint including the decks. We moved the boat out of marina and put it on a swing mooring, when the boat was slipped again it was evident again. I looked on the web and found the SeaBis site and purchased a unit since then the decks have stopped showing signs of accelerated corrosion. Although we have yet to slip the boat again to check the hull I am confident that the SeaBis unit is performing, as the decks are looking great. Two Volvo engines with a carbon fibre mast and extensive advanced corrosion to engines. One has previously been replaced. The Owner and Peter traced the cause to a separate power supply in the instrumentation. Fitted an isolating diode and isolating switches to both engines. Problem fixed.